Ever since that day I tasted the bitter, cold, canned gazpacho in Castellón, Spain, I swore I’d never eat chilled tomato soup again. It wasn’t til I hesitantly sampled a bowl of fresh gazpacho that I realized that’s what gazpacho should taste like. If it’s made with sun-ripened tomatoes, and not with metallic-tasting canned tomatoes it can taste divine. In this warm all year round climate, here in Tenerife, gazpacho is one of my favorite straightforward recipes combining the brilliant flavors of tomato, cool cucumber, and red pepper. 1. In a bowl, mix the breadcrumbs with the egg yolk and garlic. While still mixing, slowly add the olive oil. Transfer to a food processor or blender and add the remaining ingredients. Blitz until smooth. 2. Press the mixture through a sieve. Taste for seasoning. Leave to chill for at least 2 hours. 3. 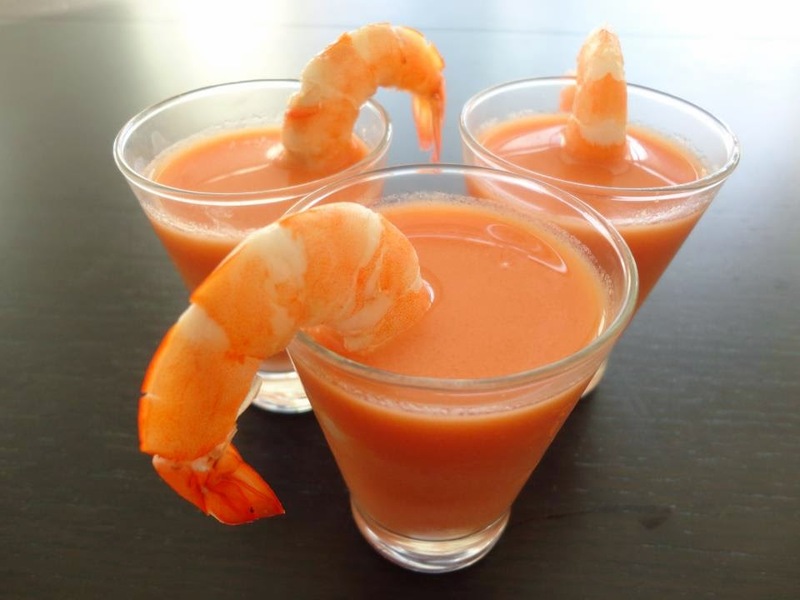 Pour the gazpacho into large shot glasses and top each one with a tiger prawn. Note: The only real time consumer here is the chopping and leaving the gazpacho to chill. It´s good knowing that you don´t have to be too fussy about the chopping, because all of the ingredients are going to be blitzed in a food processor or blender. Another peace of mind is that precooked prawns will do the trick here.